AeroFlite is a value-added assembly facility and an authorized distributor for Cinch Connectivity MIL-C-26500 Omega Series and Fuel Quantity Indicating Systems (FQIS) harnesses. Cinch is a world-wide manufacturer of precision engineered high quality, high performance, high speed connectors and cables supporting the commercial aerospace, military, and transportation markets. As a multi-national manufacturer of a wide-range of standard interconnect and new higher speed products Cinch continues to be a leader meeting the challenging new requirements of the Mil-Aero and transportation markets. Utilizing Cinch’s products AeroFlite has the in-house ability to custom engineer connector cable and harnesses to customer specifications. 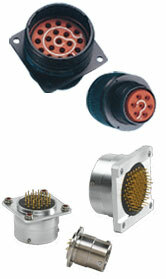 The C48 Series describes a family of connectors qualified to MIL-C-26500. While maintaining the MIL-C-26500 mating interface, this product has also been expanded to include qualifications to numerous Boeing specifications to satisfy general purpose requirements and unique product challenges for shielding, environmental sealing, fluid resistance and vibration. The expanded Cinch C48 product family offers numerous product options qualified to Boeings high performance requirements and product solutions developed for alternate terminations styles low-profile packaging.